Francesca Stajano Farm leads olive tree land sites in the district of Lecce in Southern Italy, dispersed in the countryside of Alezio, Gallipoli, Melissano and Nardò, for an extension of approximately 50 hectares on which stand about 7,000 olive trees, all as part of a centuries-old family tradition of dedication to agriculture and in particular to the oil and wine production. The oil we produce today – packaged in bottles and cans – comes from a careful selection of the produced olives, mainly “Oliarola” and “Cellina” variety. The most significant sites for the family memory are those of Melissano, from paternal ancestry, dating and part of the vast land property belonged to the Briganti family of Gallipoli, rich in ordered vineyards plants and fine olive groves, and those in Alezio where there is the business centre located in an old tenement house, which current structure dates back to the XVIII century and contains (from that time) a crusher (trappeto) semi-underground with a millstone of a rock (see photo below). 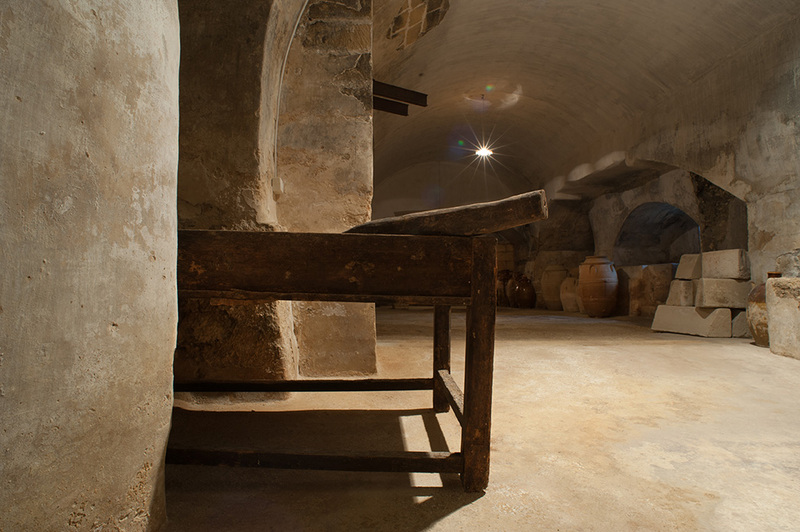 There is also a large storing oil cistern covered in bricks (later abandoned and replaced by capable stacks from “Lecce” stone in the XIX century), the millstone dates back to the XIX century (large “Lecce” stone basins to press the grapes and gather the must). It is rightly considered that where the old block described and its surroundings are located today, there were very remote settlements, of the early Middle Ages and perhaps prehistoric, given the discoveries and significant finds (always existed or accidentally brought to light) and the topographic location in the hinterland of Gallipoli (about six kilometres outside town), in a confluence of ancient roads. Messapian origins shouldn’t be excluded (the vestiges of that era are not far off: there is a necropolis and a Messapian museum in Alezio). 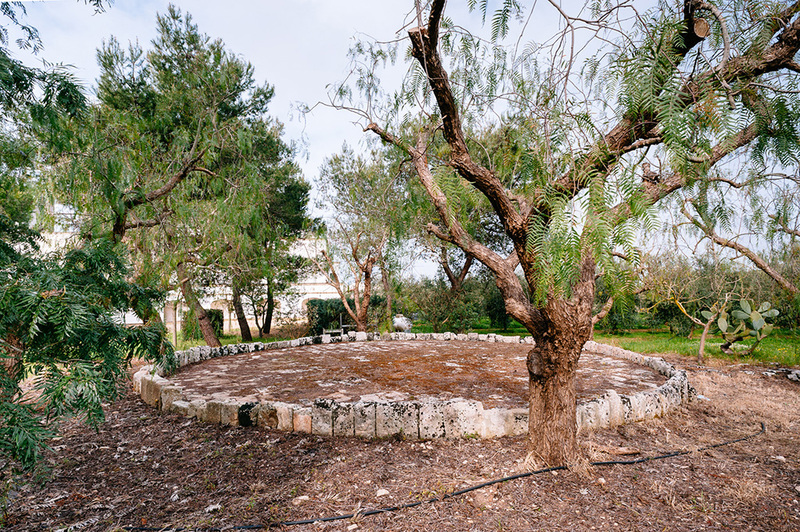 Several millstones have been discovered quite close to the building in the early twentieth century, but for their size they were believed to be used for the chalking of cereals, legumes and the like, rather than for the pressing of olives. This, along with other clues, such as survivor oaks that until the middle of last century bordered the land of the farmhouse, or thousand year-old olive trees still exist, they make believe this land, not only was always the subject of human settlements and large crops, but has also been a place where the products were converged to be measured or treated in various ways (processed, stowed, packed for marketing) and then be transferred to the port of Gallipoli for freight traffic, at least until the end of the nineteenth century, when this port rivalled in importance with the major Italian ones. The presence of a cave just a few meters away (incorporated in a building facing the farmhouse), or probably the outermost one, in which it was venerated Saint Lucy, corroborates what was said about the importance of this place in ancient times, confirming the presence of ancient human settlements. In this context of historic value, surrounded by ancient olive trees and other recently planted, lies our farm suitable for those who want to enjoy a rural setting in the quiet countryside of Salento in summertime. 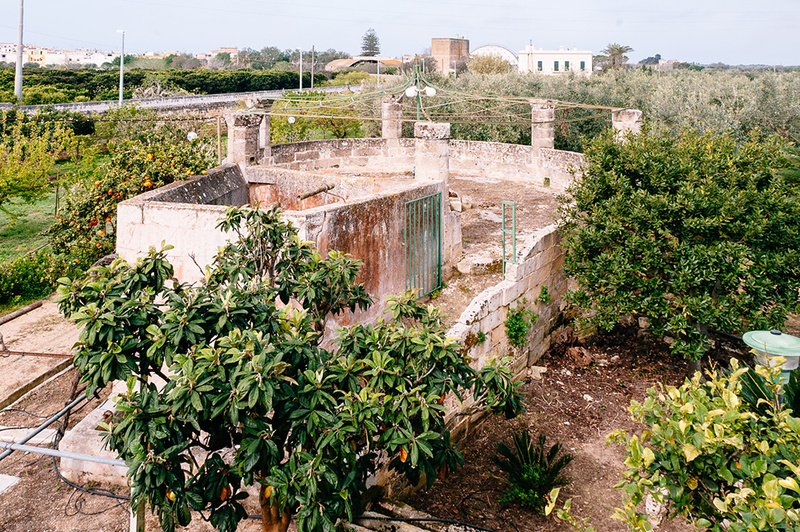 The remarkable location of the farm allows to reach Gallipoli and its surroundings in 10 minutes and take the highway to Lecce or the road to get to Ugento, Santa Maria di Leuca, Santa Cesarea Terme, Castro, Tricase, Otranto, doing the circumnavigation of Salento. When threshers and harvesters had not been invented yet, the threshing floor was the place where the grain was cleared from the straw and the ears of grain and leguminous crops from plants and pods. The primitive method was to spread, once dried well, the bundles of grain or legume plants in the threshing circle and then a group of women with sticks chattered until the separation of the fruit from the rest. After that with sieves of different sizes and also with the help of the wind, the product purified from every residue was collected in sacks and taken to their destination. When the quantities were significant, however, they used to weigh: grains or legumes arranged on the threshing floor, a horse or a mule would turn, pulling the “pisara” that is a piece of specially shaped tuff that pitching held the job of the sticks. Then, in the 1920s and 1930s of the last century, there were the cereal ventilators on the threshing floor, machines with shovels and sieves, which, driven by a crank handle, put in motion cereal ventilator shovels and sieves. The citrus grove, that once was long side the farmhouse in Alezio, needed to be irrigated during summertime, like every others in the nearby area. Given the lack of water, a series of wells connected by underground tunnels converging on the central well would supply this one gradually as the water flowed the level down, flowing water from the other wells. There was a waterwheel “ingegna” operated by a horse in the central well with the “noria” machinery for lifting water. Next to it there was a large tank for water accumulation: once filled, water was distributed to the citrus grove through a network of stone channels. “ingegna” was an ancient system of water extraction from the land peasants or wells to irrigate the fields. It was the barefoot crushing room of wine grapes. 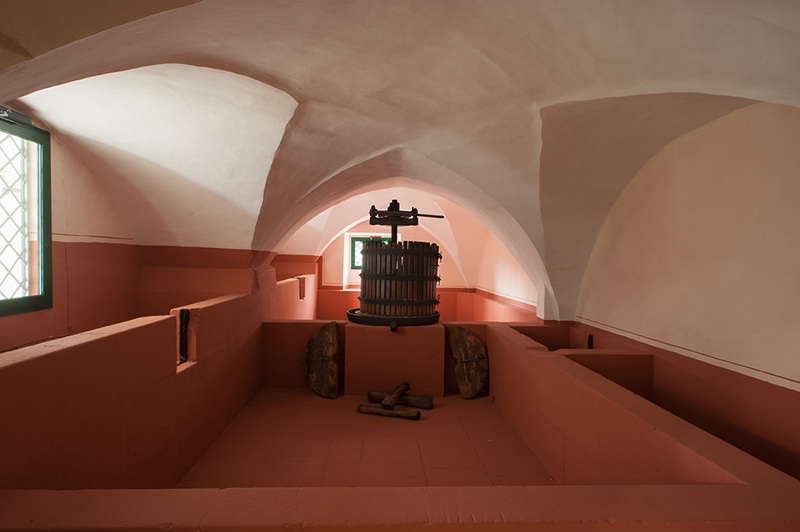 The grapes that arrived in vats were discharged and crushed on a small stage next to the must fermentation tank or on a wooden kneading-trough in bands located on the fermentation tank, the kneading-trough flowed on wooden beams at the level of the tank edges. To facilitate the fermentation downriggers were used, they were wooden poles that ended with three fins, to wash down the stalks and peels outcropping. After fermentation, the must which ended in a well connected with the tank was imbotted (the wine was put into barrels). The barrels were made either from chestnut or oak. Grinds, initially to one stone, then to two or three stones, to reduce the olives into a paste. Mussels “ozze” were large clay jars where the oil was kept for domestic use, stored in underground cellars where the temperature remains cool and constant, thus avoiding the oil both from oxidation and freezing.